BROOKLYN, New York (WTVD) -- Theo Pinson tried an alley-oop pass that went directly into the basket for a surprise 3-pointer, and the befuddled look on his face was priceless. One way or another, just about everything went right for No. 6 North Carolina in its postseason debut Thursday. Isaiah Hicks had 19 points and the Tar Heels certainly looked the part of a title contender while wearing down Miami for a 78-53 victory in the quarterfinals of the Atlantic Coast Conference Tournament. "I would look at Carolina and think they're a real threat to win the national championship," Hurricanes coach Jim Larranaga said. The top-seeded Tar Heels (27-6) got 12 points from ACC player of the year Justin Jackson and held the smaller Hurricanes to 36 percent shooting, setting up a season rubber match in the semifinals Friday night against archrival Duke, an 81-77 winner over Louisville. With the stands at Brooklyn's Barclays Center sprinkled in Carolina blue, the defending champion Tar Heels didn't disappoint their fans who made the trip north. Eyeing a pair of coveted prizes as March rolls on, North Carolina showed off some skilled passing by its big men and finished with 21 assists on 28 field goals - many of them dunks or layups. The well-rested Tar Heels had four days off between games after earning a double-round bye into the quarterfinals. "They played yesterday and we didn't have to play until today, and I think that helped us," coach Roy Williams said. Point guard Joel Berry II added 11 points and five assists, while Kennedy Meeks contributed 10 points and seven rebounds. Hicks sank all nine of his free throws for the tall and experienced Tar Heels, hoping an impressive performance in Brooklyn could land them a No. 1 seed in the NCAA Tournament. Freshman guard Bruce Brown had 21 points and seven rebounds for the ninth-seeded Hurricanes (21-11). To advance, the Tar Heels dispatched a team that's been a thorn in their side recently. They lost 77-62 at Miami on Jan. 28, mustering only 22 points on 21 percent shooting in the first half, and had dropped five of their seven games against the Hurricanes over the past six seasons. "They beat us badly last time. It was embarrassing. I watched it yesterday. It was the worst two hours I've had recently," Williams said. "I think we were more motivated today after the way they manhandled us the last time." In the rematch, North Carolina opened a 12-point lead in the first half, weathered a quick Miami spurt and pulled away to build a 66-47 advantage with 6:24 remaining. The lead only grew in the final carefree minutes, and the Hurricanes were held to 24 points in the second half. "The biggest thing, we just had to settle down, really focus on defense. Let offense come," Hicks said. "We just had to learn from our past mistakes at Miami." 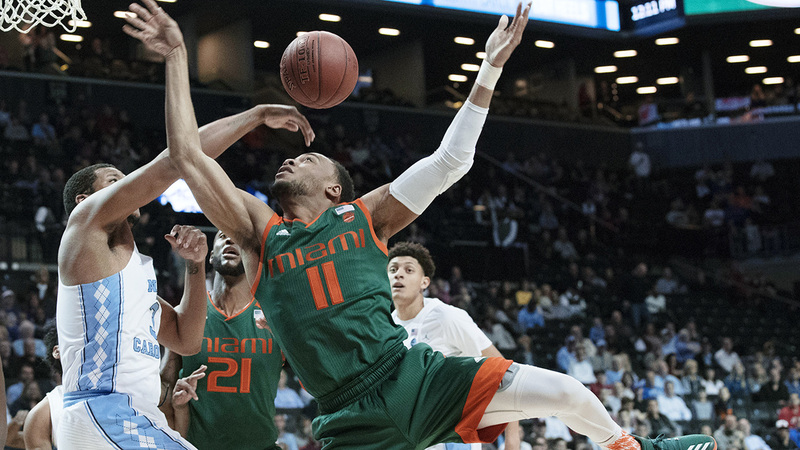 With victories over North Carolina, Duke and Virginia this season, the scrappy Hurricanes appeared to be on solid footing for the NCAAs even before winning their ACC Tournament opener against Syracuse in the face of an Orange-heavy crowd. The loss to UNC shouldn't hurt much. The Tar Heels, meanwhile are trying to become the first team to repeat as ACC champions since Duke (2009-11). If they can do that, they would tie the Blue Devils for the most titles with 19. Hicks is coming on again and that's an important development for the Tar Heels, who are 20-1 when he scores in double figures. The senior forward had 21 points on 7-of-9 shooting and nine rebounds in North Carolina's win over Duke last Saturday to end the regular season. In this one, he made his first five attempts from the field. "I had a talk with Coach - just play the game. Lose myself in the game. I feel like that's the biggest thing that helps me so far," Hicks said. Pinson had a team-high six assists, but it was his unexpected 3-pointer that had teammates in stitches. "That's Theo being Theo," senior guard Nate Britt said. "I was laughing on the way back. I thought it was hilarious." Said Williams: "It was comical, but it was Theo. Nobody else could do it except Theo. Somebody else, I'd try to strangle him, but Theo, you've got to understand that it's him."